When dealing with flammable substances, you are increasing the chance of a potential fire being started and spreading more easily, so it is important to be aware of fire protection tips on how to properly deal and handle these substances so you remain safe and can operate safely as well. There is no telling when a fire may start, but it is possible to predict what can potentially cause it. That’s why it’s always essential to have a fire protection plan in place: so you know just what to do in case a fire ever does break out. It is especially important to keep fire protection in mind when you are dealing with flammable substances. When dealing with flammable substances, you are increasing the chance of a potential fire being started and spreading more easily, so it is important to be aware of fire protection tips on how to properly deal and handle these substances so you remain safe and can operate safely as well. For most fires, using water is a great way to help put the fires out, but this is only under certain conditions. There are some fires started by certain flammable substances that will not be extinguished by fire. These fires require alternate extinguishing agents such as CO2, Foam, Inert Gases or Clean Agent chemicals such as FM200 or Novec 1230. Fire Protection Engineers (FPE’s) will assess the flammable substances in a facility and recommend the proper extinguishing agents. 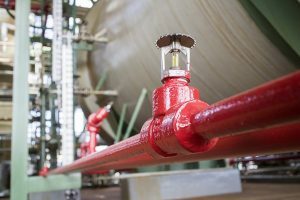 Water-based fire sprinklers are the more common form of fire protection for most facilities, but they can also be effective with various flammable substances. Sprinklers can quickly react to a sudden fire started by flammable substances; since heat triggers the sprinklers when a fire is ignited, the sprinkler heads are activated to extinguish the fire. Another helpful fire protection tip to keep in mind is watching how you are storing flammable substances. A closet or cabinet where multiple flammable substances are being kept is a cause for concern and should be stored with more care. If not properly stored, it can even be cause for a failed safety inspection. To ensure fire protection, make sure flammable substances are being handled and stored properly. Whether you need smoke detectors, fire extinguishers, or an automatic sprinkler system installed at your rental property, Fireline has you covered. We have been protecting people and their properties from fire damage since 1947—and our experience shows in our excellent work! We are known for our excellent customer service, our expertise, and our reliability. For more information on how we can help your residential or commercial property, visit us online or give us a call at (800) 553-3405. We are located in Baltimore, MD, with a second office in Leesburg, VA. For more fire safety tips, be sure to follow us on Facebook, Twitter, LinkedIn, and Google+. This entry was posted on Wednesday, August 1st, 2018 at 4:08 pm. Both comments and pings are currently closed.